Is the basal thermometer iSnow SNO-T02 suitable for determining the fertile days in the cycle with the Symptothermal Method? My test report on the range of functions, operation and much more. With the iSnow-T02 basal thermometer I have found an international Symptothermal Method thermometer, which is available in many countries and languages and is also suitable for Symptothermal Method beginners to determine the fertile days. 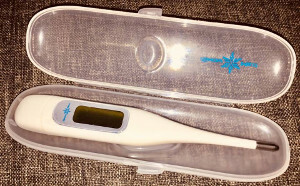 But – is the iSnow basal thermometer really suitable for Symptothermal Method application to determine the fertile days if you wish to have a child? You will learn about functionality, operation and design in my test report. What can the iSnow SNO-T02 basal thermometer do? The iSnow SNO-T02 is a very simple basal thermometer that has the necessary two decimal places to measure the temperature. As with all digital Symptothermal Method thermometers, the measured temperature values must be rounded to half a degree after the measurement, e.g. 36.63°C = 36.65°C or 36.62=36.60°C. The measurement accuracy of the iSnow SN0-T02 is in the necessary tolerance range with 0.05°C or 0.09°F. The iSnow basal thermometer has a fixed tip, which is a small disadvantage when measuring orally. Like the majority of women who use the Symptothermal Method for a longer term, I measure vaginal – that‘s why it does not matter to me. What I like is that the iSnow SNO-T02 NFP thermometer is relatively light in the hand and significantly lighter than its high-tech thermometer successor iSnow SNO-T03. The range of functions, on the other hand, is much smaller, but quite sufficient. The thermometer can store the last temperature value, so that a later entry of the measured basal temperature is possible without any problems. It is also very easy to switch between °C and °F, which will be particularly pleasing to women from the American language area. The only shortcoming is probably the measuring time, which is a maximum of two minutes, but you can easily bypass this thanks to the 3-Minutes Measurement trick. The thermometer does not have an illuminated display, so I can recommend an illuminated three-minute hourglass for better reading and keeping to the three minute measurement time. The iSnow SNO-T02 basal thermometer is simply super easy to use. To measure, simply take the Symptothermal Method thermometer into your mouth and measure for three minutes. Most women initially measure in the mouth under the tongue. Then you switch it on with the ON/OF button at the top end and wait until it “BEEPs“ three times. Your measurement will be automatically saved. You can either turn off the basal thermometer after the measurement, but even if you don‘t, then it switches off on its own after about ten minutes. Before each measurement, the thermometer should be cleaned again, for which it is easy to clean the sensor under running water. The instruction manual is in English and contains some Symptothermal Method tips for measuring, which are correct except for the recommendation for five minutes of measurement instead of a three-minute measurement. The last saved temperature value is shown automatically the next time you switch ON, so that the registration at a later time also works very easily. The switch between the temperature scales °F and °C is equally functional. To do this, you simply press the ON/OF button for three seconds and the thermometer is then automatically switched between the units. The unit that is currently set will also be displayed briefly. According to the packaging manual, the iSnow holds about 1100 measurements when used for about ten minutes a day. Shortly after switching on, however, the level of the battery is also displayed, so that you are up to date. The classic LR41 battery with 1.5V is used as batteries, which you can get almost anywhere. But it’s true that most women in the fertility period don’t have to deal with battery replacement. In Studies, about 81% of women who use Symptothermal Method became pregnant after 6 months. Here, of course, the correct application of the Symptothermal Method is very important. My Symptothermal Method Insider Tip – Temperature Measurement Alone Is Not Enough! In my experience, there are many of women who only measure the basal body temperature and think this is sufficient. As a basis for determining the fertile days, they usually use the basal temperature method. However, studies have shown that due to the strict rules with the temperature method, only in 52% of the cycles could the fertile days be determined. It was only by combining the temperature measurement with the mucus or cervix observation that the rules for evaluating the temperature curve could be simplified. Women who use the Symptothermal Method and thus use mucus and temperature to determine the fertile days were able to determine the fertile days in 94.5% of cycles. 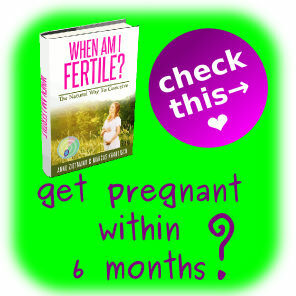 We recommend that you learn the Symptothermal Method with our eBook “WHEN AM I FERTILE?“. In the first chapter, you‘ll find a step-by-step guide on how to use the Symptothermal Method on your own, and five exercise cycles including solutions. In the second chapter there is crystal clear information about cycle diagnostics, with which the reasons why it has not worked out so far with the pregnancy can be narrowed down. In the last chapter you will find 15 motivating testimonials of women who have become pregnant with the Symptothermal Method despite shiftwork, irregular cycle, long waiting time, PCOS, Endometriosis, Hashimoto and Luteal Insufficiency. The design of the iSnow SNO-T02 NFP thermometer is appealing. The Case and the Basal thermometer are very lightweight and therefore fully well suited for temperature measurement when travelling or on the go. For me personally, the L-Care Basal Thermometer, that you can choose by the way in your favourite colour, looks a little more chic. But this is a matter of taste. Very striking is the very large dial, which is particularly suitable for morning measurement in doze or for far-sighted women. Overall, the *iSnow T02 Basal Thermometer is a good Symptothermal Method thermometer for all Symptothermal Method beginners looking for an easy-to-use Basal thermometer. If you apply the three-minute measuring trick, you should cope well with the basal thermometer and measure great values with it. Personally, I find simple thermometers with which every woman copes much better than technically highly complex Symptothermal Method thermometers including app with 1000 settings. For one thing, a Study by the Stiftung Warentest on fertility apps found that most apps are simply not suitable for determining the fertile days. Similarly, the thermometers are more susceptible to technical errors because they are highly complex devices. Especially for beginners, the thermometer should be able to essentially do one thing, namely to measure the temperature and be more robust in the technical implementation. In this respect, I find the iSnow with the simple operation simply super simple and therefore very suitable for Symptothermal Method beginners with the desire to get pregnant quickly.